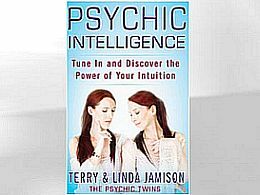 The psychic twins, Terry and Linda Jamison, have amazed people all over the world with their fantastic predictions. In the book “Psychic Intelligence – Tune In and Discover the Power of Your Intuition” they share their knowledge to teach you to develop your own intuition. The psychic twins predicted the terrorist attack on the World Trade Center two years before it happened, two stock market crashes, and the election and reelection of President Bush. Terry and Linda Jamison have also been psychic detectives on a high-profile case involving the disappearance of Olivia Newton John’s boyfriend. The twin sisters explained that Olivia’s missing boyfriend was not dead, but was in fact somewhere in Mexico, which was later confirmed. Why should you read Psychic Intelligence? The book “Psychic Intelligence” will help you to tune in to your own psychic abilities. This book is a great read for any newbie or experienced person that aims to develop their intuitions further. The book is written in the third person format, from the perspective of themselves as twins. The style of writing is light and easy to understand. There is a total of 19 chapters to read, which are divided into four parts. Part 1: The first part discusses that we all have a psychic within us and it is just a matter of tuning in to our true self. Part 2: The second part explains about the four ”clairs” that we can tap in to and become more intuitive, which are clair-voyance, clair-audience, clair-sentience, and clair-cognizance. Part 3: This part in the book focuses on the different tools you can use to unleash your powers. Part 4: In the fourth and last part the twins talks about putting your powers to work in different aspects of life. Some of the tools and skills discussed in ”Psychic Intelligence” revolve around meditations and psychic protection. The twins mention that an important part in intuitive development is to be able to protect yourself from the people you interact with. Great exercises to boost your psychic protection are laid out in the book. The psychic twins do also discuss how you can remove or reduce the blocks that impede you from moving forward so that psychic information can come easily to you. The twins themselves use what is called channeled writing when they receive information, which is something that you will be introduced to if you buy the book. There is an array of other spiritual topics that you will be presented, and the important thing is to try them out. Why? Because, you want to figure out which one is the right for you. What works to unleash one persons gifts may not work for you. Are you ready to learn to dissolve the blocks that prevent you from using and trusting your own intuition? We can warmly recommend the book “Psychic Intelligence – Tune In and Discover the Power of Your Intuition “. Many other people that have bought the book have good things to say about it. You can read reviews here.